"Show Me State" Steps up for Power Shift! 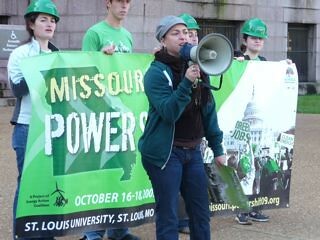 I just returned from Missouri Power Shift and I can report that the movement for clean energy, green jobs and climate justice is alive and well amongst the students of the "Show Me State." In fact, Missouri, though home of the headquarters of Peabody Coal, is also is home to Rockport, MO -- one of the first towns in the U.S that is %100 powered by wind energy! Plus, organizations like Greening Missouri Youth are focusing their newly acquired stimulus money on green training programs for 18-24 year olds. They are expanding to include training for displaced workers from the automotive and coal industry in the wind power industry. Our allies at the Energy Action Coalition (EAC) got busy this fall and are in the midst of producing eleven regional Power Shift conferences across the nation this fall - you can check out their website for where other conferences are happening. I'm a Green For All Academy Fellow and Hip Hop artist -- and I was able to present and perform as an ACE rep at the event. I arrived early last week, visited several MO high schools and presented to students about climate science and the upcoming event. With the support of EAC, we teamed up and ensured high school youth feel included in this movement. One senior from the ACE/Power Shift workshop talked about how she previously felt alone in her school, up against her own administration in trying to get water bottles banned in her school, for example. She left feeling inspired that there were many other high-schoolers that have not only changed their schools, but their communities. The St. Louis youth are smart, passionate and unstoppable. They understand we are up against the mighty forces of the oil and mining companies and their multi-million dollar lobbies. Workshops were filled with students who understand that time is running out for us to drastically reduce our carbon output, as already, global warming is causing floods, deserts and climate refugees. They also understand that many Americans have been left out of the pollution-based economy and want to make sure that the green economy is truly inclusive. 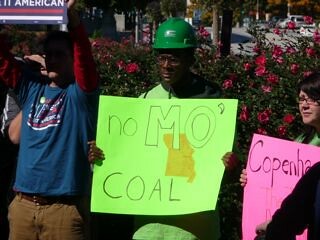 Their activism is focused on encouraging their representative, Senator McCaskill to help pass a strong clean energy jobs bill. Check out ACE's Flickr page for more pictures!